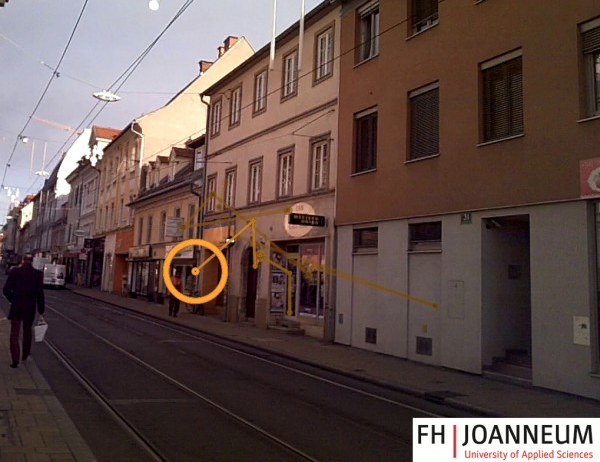 The co-creation briefing trail continues to Graz, where the Austrian Human Cities partners FH Joanneum, Department of Exhibition Design are scheming to creating an array of creative initiatives in the Jakomini Neighbourhood throughout 2016. Now, working with people is an inexact science and that makes it difficult to measure the impact that any initiative might have. Yet we live in a time that hungers for performance indicators, monitoring, evaluation, outcome tracking and impact measurement and many-a Human Citizen has been musing over how one is to quantify the impact on humans of incremental change!? The colleagues in Graz have taken a front seat and during our co-creating briefing, we pioneered a new eye-tracking device. This combines the sedentary eye-tracking techniques with live recording and combines the two in an image stream of where the person wearing the glasses is focussing their gaze. This is a film of the movement of focus in time, of which the above image is a still. The orange circle defines where the current focus is, whilst the lines are where it came from and moves to, respectively. In motion the circle is traveling along the line, as the line is snaking through the city-scape. Only time will tell if, when or how we will utilise this to understand change. Right now, we are experimenting with the experimentation and the great minds will go back to creating initiatives on the ground in Jakomini. Keep your eyes peeled for a season of action in Spring!